“Sequential levelled readers” are making their punctual way to the house in the backpack, one every week. The teacher leans forward and says, mysteriously, “There is a difference between decoding and comprehension. Perhaps she is decoding that book, but she isn’t comprehending it.” Raised fingers twitch around his words. Shout out to the children’s librarians at Brentwood library who made many excellent book suggestions and eventually gently told me I might do better in the adult section. And another shout out to my parents, who never limited my reading but who offered to read and discuss anything I wanted them to. I’m following their excellent example on this with M.
It’s good to read things that challenge, that you might not absolutely understand. Sometimes you need to let the language wash over you, take from it what you can, and come back some years later. How else can we learn? How else can we learn elegance? Some of the worst, most passive writing I’ve yet seen on this topic. She makes it sound like parents can’t do a single thing to put boundaries around technology use. Well, for a start, you can not take the screen into the car. Also you can not provide your children with Internet access you can’t supervise. I mean really, people. I’m not entirely sure of the potential benefits of acclimatizing bees to cocaine, really. "For hand towels, astronauts get those little vacuum-packed pucks that you kind of have to unravel…"
"The octopus-like movements and appearance of both protists reminded James of the horrid Cthulhu and…"
"Until now, brain imaging specialists like me who deal with human injuries caused by trauma to…"
"Here we show that with a simple, synthetic active system, we can reproduce some features of living…"
The answer is about 1.6 candy bars worth of energy, which is rather less than I would’ve guessed. Finally, the findings suggest that people often engage in multi-tasking because they are less able to block out distractions and focus on a singular task. Participants with less executive control – low scorers on the Operation Span task and persons high in impulsivity – tended to report higher levels of multi-tasking activity. In other words, people who like to multi-task and think they’re good at it are pretty much delusional. In a new study, researchers Nathan Witthoft and Jonathan Winawer of Stanford University present data from 11 color grapheme synesthetes who had startlingly similar color-letter pairings that were traceable to childhood toys containing magnetic colored letters. An interesting turn of phrase and an interesting debate. PLOS ONE: How Large Should Whales Be? The title implies that one can consider this as a sort of abstract idea for one’s own judgement: really, how large DO you think a whale really should be? The article, sadly, is about the usual sort of size-regulation issues in mammals. But never mind. The title is such fun. Earlier this week the National Highway Traffic Safety Administration finally published its proposed “quiet car rule,” mandated by the Pedestrian Safety Enhancement Act of 2010, setting out standards for what the quiet cars of the future must sound like. And the long-awaited answer: They must sound like… cars. A very disappointing decision. There must be ways to protect pedestrians other than adding to ambient noise pollution. Algonquin Park is no place for a cottage. Or is it? Their presence, however, restricts the park’s use. Most of the cottages are on lakes close to Highway 60 — Cache Lake, Canoe Lake and Smoke Lake. And people aren’t allowed to camp on lakes with cottagers. Twenty-one of the leased lots are in the park’s interior. Winters says the government should phase out those leases. Canoeists who make the effort of portaging their way deep into the park should be rewarded with an environment more natural than lakes with cottages, Winters says. The debate over cottagers, Winters argues, distracts from greater pressures threatening Algonquin. Fully 51 per cent of the park is open to logging. Winters’ concern is the 6,000 kilometres of gravel roads mostly built and reserved for logging. As roads proliferate, so will the demand for their use for reasons other than logging, he argues. “There’s no bigger issue in Algonquin Park than roads,” he says. Good, evenhanded article. They’re entirely correct, although (I did a huge piece of research on this way back in grad school) from the article it’s not clear that Algonquin does work quite well as a multi-use park. 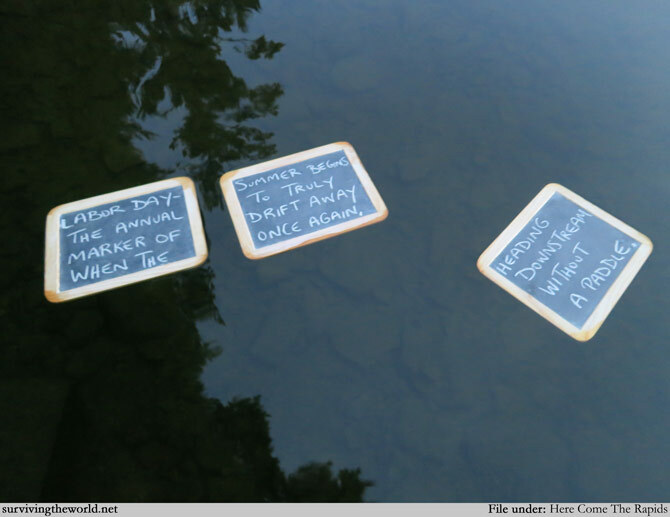 Trippers rarely see or hear any logging… unless they go more than 150m inland, which they seldom do, and the logging roads are not typically marked on canoe maps. The roads would be excellent for biking, horse-riding and other similar pursuits if such uses could be deconflicted with the logging-truck use. As things stand, both cottaging and logging are critical to the whole area’s economic success. And I do say that as an environmentalist and a canoe-tripper! Algonquin is a great example of how one space can accommodate multiple uses with a bit of compromise and thought. If the government does eventually take over the cottages I’d suggest we rent them out instead of destroying them. They’d be a nice Night 1 or end-night for serious trippers and would be a great stepping-stone into the woods for the less-experienced. Rather than finding a way to turn their most dedicated users into content creators for the larger masses of users, they just took their tools away, alienating a group that had *loved* their product. And for what? A G product with a huge nominal user base and a much, much, much smaller actual community. I still resent that they went out of their way to break Reader. It’s caused me tons of work and many tedious workarounds for things that used to be bog simple. 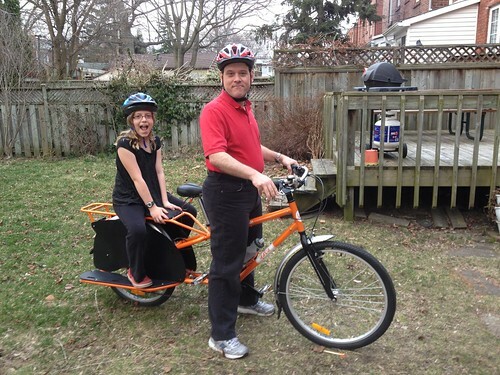 So back in March we bought a cargo bike. We’d set out intending to buy a tandem, but on the test ride it turned out that I hated the tandem with the intensity of a thousand burning suns within about ten seconds of getting on the thing. Totally synced starts and stops? No control? Ummmmno. Not working for me. But since we were at a good bike shop we tried this massive, bright orange Yuba Mundo cargo bike because it was there, and we all loved it immediately, bought it on the spot, and nicknamed it The Beast. Since then we’ve put the better part of 2000km on the thing, what with schlepping the miss to school (~8km away) and many trips to the grocery store and Home Depot and general errands and whatnot. It’s put a huge dent in our Autoshare usage — when your bike carries 75lbs of tomato flats, 6 2-4s of beer, 8 large bags of groceries, or two human passengers, a car becomes much less necessary — and wow pushing its 50lbs around (often plus a heavy 10-year-old child plus our own pannier plus her school backpack, or whatever other cargo one has loaded on) has been good for our quads and general aerobic fitness. We put a little over 100km on it each week during the school year — 5x20km on weekdays plus a grocery run and maybe a Home Depot run or something similar on weekends. It is in very heavy use. 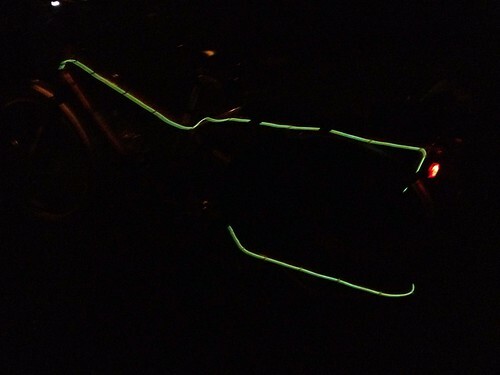 The BikeGlow runs down the length of the left (traffic side) running board, up the back (not visible in the photo), and then forward the entire length of the bike. It’s a very sociable thing, riding a cargo bike, whether you like it or not. At stops one is forever answering the questions of other cyclists and pedestrian passers-by. What the heck is that thing (A long-tail cargo bike. It can carry 440lbs of cargo plus the rider. The other main kind of cargo bike is a bakfiets)? Is that legal (Yes. While you can’t carry passengers on bikes not intended for it, bikes designed for passengers are just fine.)? Where did you get it (Urbane, although Sweet Pete’s also probably carries them)? And the sexist one I get that Dave doesn’t: Can you really ride that thing All By Yourself Dearie (hell yes). …Among other things. Now that we have the BikeGlow and it’s dark by 5pm, we also get to chat about that. So: don’t buy a cargo bike if you’re averse to random conversations with passers-by. Eventually we plan to put a big sticker on the bike with a QR code which links to some sort of explanation and details, much like this post. Once you’re up to speed, riding it is less work than you might think. It’s the acceleration that’s killer. There are 21 gears on the thing and we use every one — I use many, many more gears on the cargo bike than I do on my own bike, especially on hills. On average I probably change gears every ten seconds or so, less if going up a hill. It is otherwise a very smooth and pleasant ride, though; rather similar in feel to a Bixi, if you’ve ever ridden one of those. Lots of stability, lots of momentum. Hit someone with the thing going reasonably quickly and you’ll probably kill them, so look out. It has power but it is crazy heavy and it is not what one might call nimble. We’ve found it a really excellent substitute for both Autoshare and the TTC. We haven’t quantified the Autoshare part, but we’ve made about 120 round trips on it that would have otherwise required the TTC, so one adult at 2x$2.60 + one child at 2x$0.60 = $6.40 per round trip, that’s saved us roughly $768. At that rate it’ll pay itself off in another year or so. Not that we’re fussed about that — we prefer riding; it’s not about the money — but it’s kind of fun to track. In short: recommended. You can put 2 baby seats, 2 child seats, 2 very large cargo bags, or a combination of the above on the back. Or you can just go wild with bungee cords. Cargo bikes really solve many of the problems with using a bike as your primary transportation in a reasonably bike-friendly environment. We’re very fond of our Beast. I don’t agree with him on everything, but he has a point. I also think it’s useful to continue the separation of functions between universities and colleges (we need to stop underfunding the colleges) — and to make it easier for students’ to study at both kinds of institutions, where it’s useful to do so (as it so often is). Students get to read widely and gain a sense of what human beings have been up to over the millennia. This expands their awareness and readies them to appreciate their own lives while contributing to enhancing the lives of others. Plus they learn to think critically, which is important to functioning as citizens rather than social cogs. Universities may not often achieve those ends but it is what they’re suited for, versus spitting out a customized workforce. Even little kids behave less selfishly when others are watching. Choice should be delightful, not debilitating. The secret of it is that there is no wrong book to read. Even if you’re re-reading Harry Potter on the subway. So maybe we should take the opportunity to cast aside the textbooks inside of which we’re hiding our comics books, and embrace the fact that we can strive to expand our reading habits without beating ourselves up—and that most importantly, guilt adds nothing to the reading experience. It turns out that depression may not be a mere trade-off for a vigorous immune response. Dr. Miller suggests that depressive symptoms like social withdrawal, lack of energy, and a loss of interest in once enjoyable activities were actually advantageous to our ancestors. For example, a loss of energy might ensure that the body can leverage all of its energy to fight an infection. Also, social withdrawal minimizes the likelihood of being exposed to additional infectious agents. Interesting, if not entirely convincing. More evidence needed, etc. About 76 per year. Between 1999 and 2009, 761 Americans died falling from cliffs, according to the CDC’s magnificently detailed data. That’s a relatively small number. If commentators wanted to scare the public, they might have called the looming economic crisis, the “fiscal anvil,” because falling objects killed nearly 10 times as many people as cliffs between 1999 and 2009. Or they might have gone with the “fiscal cobra,” as venomous plants and animals killed 856 people in the same 10-year period. Another option would be the “fiscal hansom cab,” since 1,201 Americans perished while riding on an animal or in an animal-drawn vehicle. A woman developed severe blood poisoning and a liver abscess after inadvertently swallowing a toothpick. The toothpick perforated her gullet and lodged in a lobe of her liver. …proved the North American pit vipers reproduced without a male, a phenomenon called facultative parthenogenesis that has previously been found only in captive species. Of course it would be pit vipers and not fluffy bunnies, wouldn’t it. The results show a strong negative effect of neighbourhood income deprivation on altruistic behaviour, with letters dropped in the poorest neighbourhoods having 91% lower odds of being returned than letters dropped in the wealthiest neighbourhoods. We suggest that measures of altruism are strongly context dependant. For those of you who are wondering how you weaponise shark teeth, which are already regenerating, serrated meat knives at the business end of a streamlined, electric-sensing torpedo, here’s how. You drill a tiny hole in them, and then bind them in long rows to a piece of wood to make a sword. Or a trident. Or a four-metre-long lance. And then, presumably, you hit people really hard with them. The scientists need a standardized material for testing their toilets, and that’s where the fake poop comes in. Soybean paste is extruded into 350 gram segments for testing in toilets. They can’t use the real stuff because it’s a hazardous material, and of course, it’s noxious. So the foundation turned to the experts of fake feces — Maximum Performance, which distributes synthetic poop to nearly all toilet manufacturers around the world for testing purposes. I am glad there’s someone out there who is worrying about creating standardized fake poop for testing toilets. I’m VERY glad it is not me. Previous studies have linked this disorder to an increased risk of stroke and structural brain lesions, but it has remained unclear whether migraines had other negative consequences such as dementia or cognitive decline. According to new research from Brigham and Women’s Hospital (BWH), migraines are not associated with cognitive decline. Over the course of 10 weeks, the link between less lying and improved health was significantly stronger for participants in the no-lie group, the study found. For example, when participants in the no-lie group told three fewer white lies than they did in other weeks, they experienced on average about four fewer mental-health complaints, such as feeling tense or melancholy, and about three fewer physical complaints, such as sore throats and headaches, the study found. In contrast, when control group members told three fewer white lies, they experienced two fewer mental-health complaints and about one less physical complaint. The pattern was similar for major lies, Kelly said. Ninety-nine children (8–12 year olds) listened to stories wherein one character made either a literal or ironic criticism or a literal or ironic compliment. Children appraised the speaker’s belief and communicative intention. Shyness was assessed using self-report measures of social anxiety symptoms and shy negative affect. Shyness was not related to children’s comprehension of the counterfactual nature of ironic statements. However, shyness was related to children’s ratings of speaker meanness for ironic statements. The function of water in sandcastles is to form small ‘bridges’ which make the grains of sand stick together, thus increasing the solidity of the structure. The researchers show that the optimum amount of water is very small (only a few per cent). If this optimum concentration is used, sandcastles reaching five metres in height can be built. Cause-and-effect thinking is critical to human survival, Legare said. So it’s natural for people to find logic in supernatural rituals that emphasize repetition and procedural steps. If doing something once has some effect, then repeating it must have a greater effect. …participants experienced ownership over the virtual arm up to three times the length of the real one, and less strongly at four times the length. The illusion did decline, however, with the length of the virtual arm. Bit like teenagers in horror movies, really.